When Raul Srugo took the control on Maccabi Rishon LeZion he declared that “we will become a European club”. He brought one of the best Israeli head coaches of all time, Saar Frenkel, and took the 2017 Israeli championship. Afterward, they tried to give a fight for Chambery Savoie in the EHF Cup 2ndround but the French team was too good for them. 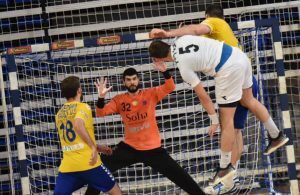 In the end of last season they lost the championship to the biggest rival Hapoel (who took the Israeli cup also) but after last week it looks like that finally Maccabi is closer to the targets of the richest club in the Israeli handball history. It all started with very surprising 30:27 away on Saint Raphael in the EHF Cup 3rd round (that wasn’t enough because of 29:36 in the first match). On Friday, Frenkel’s players were better than the champions of Hapoel in the Rishon LeZion derby and beat them 33:28. Hapoel management took a big decision before the current season that they want to reduce the budget and bring young players from the U19 team. 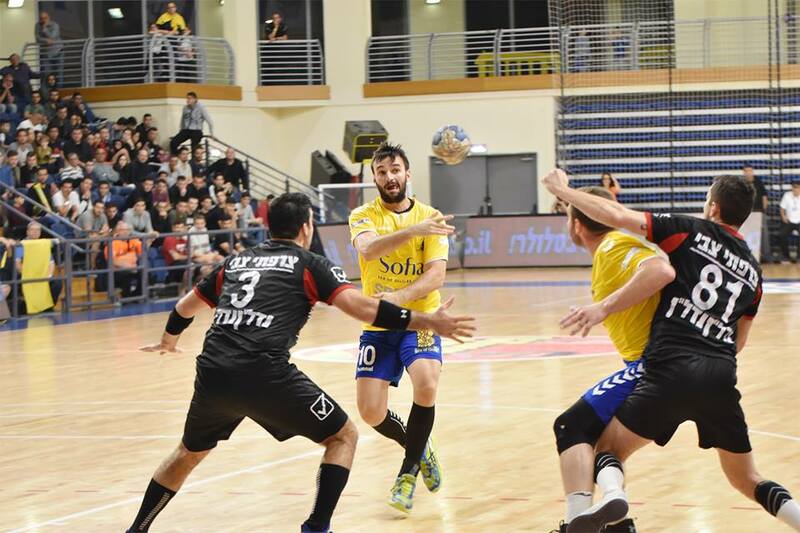 The result came in the Rishon LeZion derby while without the injured Novak Boskovic, Idan Maimon didn’t have a fine replacement in the field or on the bench. In the beginning, Hapoel attack wasn’t effective while Maccabi took a 3:0 lead after 5 minutes. Maimon took the first time out in the 6th minute and got the first goal from Savo Mester. One minute later, there was a trash talk between Hapoel coach, Idan Maimon, and Maccabi’s Pivot, Rastko Stojkovic. In the end of that, both of them got 2 minutes suspension. The 3 goals difference stayed because of the Israeli national goalkeeper of Hapoel, Moshiko Elimelech, who was very effective with 5 stops until the 17th minute. He led Hapoel back to 10:8 deficit in the 22th minute, when Frenkel took his own first time out. Until the halftime, Maccabi players improved the attacking decisions and the goalkeeper, Dan Tepper, stopped few shots that helped his team to get a 14:10 lead. In the 34th minute, Savo Mester suffered a massive injury in his leg and Hapoel stayed without any foreign player in the field. The champions showed amazing character, came back to 17:15 in the 37th minute. Idan Maimon had to use young players , it was very impressive but not enough at all. Until the end Maccabi players were too good for them and they won 33:28. Scored for Maccabi: Rastko Stojkovic – 10, Amit Stelman – 7, Marko Matic – 5, Yoni Rosental and Yirmi Sidi – 4, Omer Gera, Ivan Karacic and Vladi Kofman – 1. Scored for Hapoel: Shaun Sless – 7, Eran Zarfati – 6, Daniel Shkalim – 5, Savo Mester – 3, Yuval Gerera and Rotem Bar – 2, Guy Cohen, Ido Lavie and Itay Surkis – 1. Other Results: H.C Beer Sheba – Hapoel Ramat Gan 33:24, Hapoel Ashdod – H.C Holon 34:31, H.C Ness Ziona – Hapoel Kiryat Ono 35:26, Ironi Rehovot – SGS Ramat Hasharon 28:35, Maccabi Kiryat Motzkin – Bnei Herzliya 28:38. Monday: 19:30- Hapoel Rishon LeZion – H.C Beer Sheba, 20:00- H.C Holon – Maccabi Kiryat Motzkin, Hapoel Ramat Gan – Ironi Rehovot, Hapoel Kiryat Ono – Maccabi Rishon LeZion, 20:30- Bnei Herzliya – H.C Ness Ziona. Tuesday: 20:00- SGS Ramat Hasharon – Hapoel Ashdod. ← Previous Story Overreaction of fans in Skopje, Dujsheabev: It’s shameful, come to see you 1 on 1!